Against which diseases are they recommended? They are recommended for prevention and treatment of anemia across the life cycle i.e. 6months – 5 yr, 5 – 10 yr, 10 – 19 yr., women in reproductive age, during pregnancy and lactation. Mention some iron rich foods. •	Heme iron: Liver, meat, poultry, and fish. •	Nonheme iron: Green leafy vegetables, legumes, cereals, nuts and oilseeds, jaggery, and dried fruits. Enumerate the anatomic sites to be examined for detecting pallor. What is "Iron Plus Initiative"? Also to include additional age groups for IFA supplementation – thereby providing prevention and treatment of anemia across the life cycle i.e. 1. 6months – 5 yr.
2. 5 – 10 yr.
3. 10 – 19 yr.
5. During pregnancy and lactation. What is the frequency of IFA administration for the beneficiary age groups? What is the recommended strength of the tablets for a pregnant woman under the National program? These tablets contain 100 mg of elemental iron and 500 µg of folic acid. Mention the prophylactic and therapeutic doses recommended for a pregnant lady, under the National program. •	For prophylaxis (prevention of anemia): One tablet once daily for a period of 100 days, starting after 12 weeks (first trimester) of pregnancy. Hence a total of 100 tablets are to be dispensed. •	For treating anemia: One tablet twice a day for 100 days, starting after the first trimester. Hence a total of 200 tablets are to be dispensed. After starting the therapeutic dose, Hb levels should be reassessed at monthly intervals. If on testing, Hb has come up to normal level, the prophylactic dose can be resumed. If it does not rise in spite of the administration of 2 tablets of IFA daily and dietary supplementation, the woman should be referred to the next higher health facility for further management. What advice would you give to a recipient consuming the IFA tablet? •	The recipient of IFA tablet should consume the tablet after meals to avoid gastric discomfort and nausea. •	She may pass black stools after consuming IFA tablets. •	She may experience loose stools or constipation for some time but this will settle after some days. •	Avoid taking the tablets with tea, coffee or milk as these may interfere with absorption of iron. •	Calcium tablets should not be taken at the same time as calcium inhibits absorption of iron. •	In case of pregnant or lactating woman: She must consume the tablets daily. 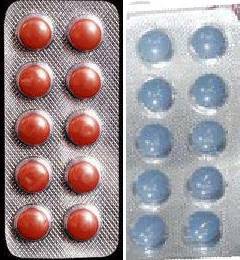 Why the IFA tablets for school children, blue in colour? What is ‘Weekly Iron and Folic acid supplementation (WIFS)’? 	Also known as WIFS-Blue campaign. Teachers and AWWs will supervise the ingestion of the IFA tablet by the beneficiaries. What is the cut-off hemoglobin level for diagnosing anemia? Why do the beneficiary age groups begin from 6 months of age? The onset of anaemia in young children is generally after 6 months of age. Before this, iron in breast milk is sufficient to meet the needs of a breastfed child. Iron from breast milk is in a form that is more easily bio-available to the young child. Therefore the incidence of anaemia increases from 6–8 months till the child is 1 year old. In India, diets for children in the age group 6–23 months are predominantly plant-based and provide insufficient amounts of micronutrients to meet the recommended nutrient intakes. Are there any contraindications for IFA prophylaxis? •	History of repeated blood transfusion. What is the main cause of Iron deficiency anemia (IDA) in children? Iron requirements increase during the period of active growth in childhood, especially from 6 months to 3 years. In infancy, iron deficiency is most often the result of lack of exclusive breast feeding and use of un-supplemented milk diets. Milk products are very poor sources of iron and prolonged breast or bottle feeding of the infant without complementary feeds after 6 months of age frequently lead to iron deficiency unless there is iron supplementation. Iron requirements are proportionately greater in premature and underweight babies. In older children, a predominantly milk and cereal based diet and food fads can also lead to IDA. Why is deworming recommended along with iron prophylaxis? Helminths such as hookworm and flukes cause chronic blood loss and consequently iron loss from the body, resulting in the development of anaemia. A hookworm burden of 40–160 worms (depending on the iron status of the host) may result in IDA. Mention some foods which enhance the absorption of iron. Mention some inhibitors of iron absorption. What is the recommended daily allowance of iron during pregnancy? 2. Park K. Nutrition and Health. In: Park's Textbook of Preventive and Social Medicine, 24th ed. Jabalpur, India: M/S Banarasidas Bhanot Publishers; 2017.